do not enter grasslands or flower fields. Entering areas outside of walking paths and rest areas is prohibited, whether or not there are signs or ropes. The plants live in a harsh environment and even small intrusions can greatly affect them. This applies when taking photographs as well; do not step off the path for pictures. If you see a rock ptarmigan, watch it quietly and don’t chase it. Lots of people spending time watching the ptarmigan could prevent it from going about its merry way, and the eggs in its nest could end up cooling down, or the chicks might freeze without the heat from their mother’s belly. 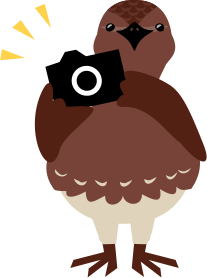 Please be considerate of the ptarmigans, and don’t chase them, or become too enthralled with them while watching them from afar. Do not pick the plants. If you want to take something home, take a picture. Alpine plants are beautiful, and also extremely delicate. Even a small disturbance can destroy the entire plant. These alpine plants have been blossoming for thousands of years - help preserve them for years to come. Take home your trash, including cigarette butts. Keep the mountains clean, just as you would with your own home and garden. Let future visitors experience the same beautiful landscape that you did on your visit. Leaving food may cause crows and rats to come up to the mountains, which would have a severely negative impact on the ecosystem. 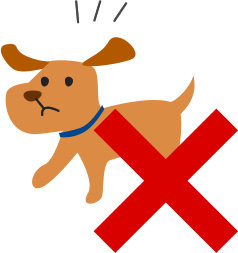 Pets risk bringing in germs and bacteria not seen in the mountains through their fur and stool. The rock ptarmigan, a symbol of these mountains, does not have resistance to these germs. Please help protect precious creatures such as the rock ptarmigan by leaving your pets at home. As humans, we also carry bacteria in our waste, which can have a major effect on the health of animals and plants in the mountains. Please plan accordingly and use the huts and public restrooms. You may also purchase portable toilets; please carry them if necessary. As the mating season, spring is a very important time for the rock ptarmigan. 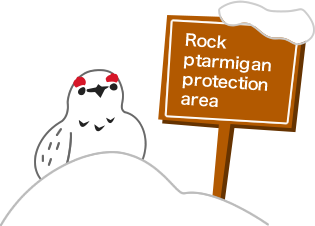 In order to protect the rock ptarmigan, we ask that you do not walk, ski, or snowboard in designated reserves. Since rock ptarmigans may also be keeping warm in their nests in the snow, watch your step while walking over the snow.